We report a case of fulminant multiple organ failure including the Acute Respiratory Distress Syndrome (ARDS), haemodynamic, and renal failure due to community-acquired methicillin-sensitive Panton Valentine Leukocidin (PVL) positive spa-type 284 (ST121) Staphylococcus aureus septic shock. The patient's first clinical symptom was necrotizing pneumonia. Despite organism-sensitive triple antibiotic therapy with linezolid, imipenem and clindamycin from the first day of treatment, progressive abscess formation in multiple skeletal muscles was observed. As a result, repeated surgical interventions became necessary. Due to progressive soft tissue infection, the anti-microbial therapy was changed to a combination of clindamycin and daptomycin. Continued surgical and antimicrobial therapy finally led to a stabilisation of the patients' condition. The clinical course of our patient underlines the existence of a "PVL-syndrome" which is independent of in vitro Staphylococcus aureus susceptibility. The PVL-syndrome should not only be considered in patients with soft tissue or bone infection, but also in patients with pneumonia. Such a condition, which may easily be mistaken for uncomplicated pneumonia, should be treated early, aggressively and over a long period of time in order to avoid relapsing infection. Panton Valentine Leukocidin (PVL) positive staphylococcal infection typically presents as life-threateninginfection of soft-tissues and bones [1, 2]. PVL-positive staphylococcal infection may also lead to necrotizing pneumonia, a condition which can even be observed before the onset of soft-tissue or bone infection [3, 4]. The underlying molecular mechanisms in regard to the progression of PVL-positive staphylococcal necrotizing pneumonia and respective methods of bacterial invasion have recently been elucidated [5, 6]. The genes encoding the exotoxin PVL are typically present in community-acquired methicillin-sensitive S. aureus (CA-MSSA) , with about 2–5% of PVL-positive MSSA strains. Nevertheless, this varies markedly in different geographic locations. However, first cases of community-acquired methicillin-resistant S. aureus (CA-MRSA) have been reported. Clonal spread of PVL-positive strains and horizontal bacteriophage-dependent PVL-gene transfer thus contribute to an emerging health care problem [7, 8]. Although the value of routine PVL testing in staphylococcal infection is currently unclear, both patient and household members should undergo PVL testing in severe or recurrent S. aureus infection in order to prevent the spreading of these strains. De-colonization of the patient and respective household members should then be achieved [9, 10]. 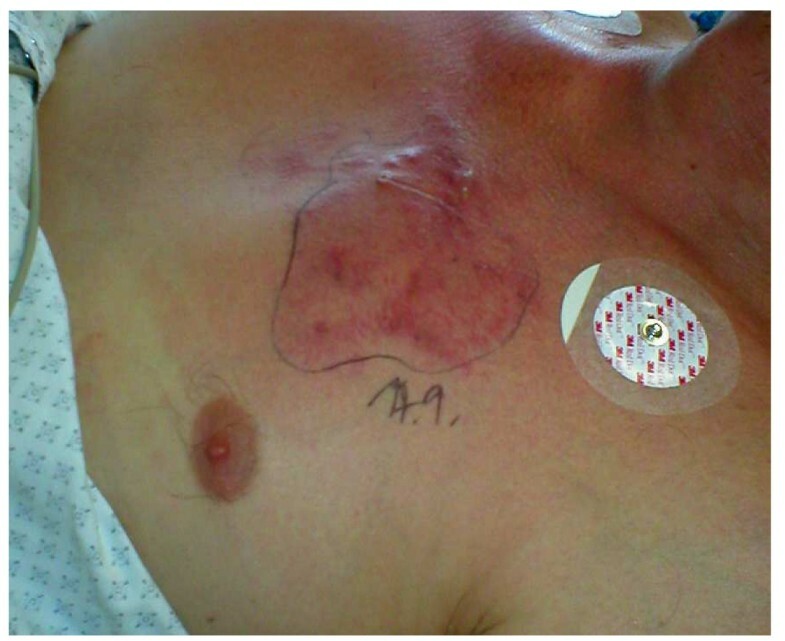 We report the case of a 51-year old previously healthy immunocompetent Caucasian male who developed acute illness with fever, dyspnoea and expectoration of bloody sputum during a diving holiday in Croatia. 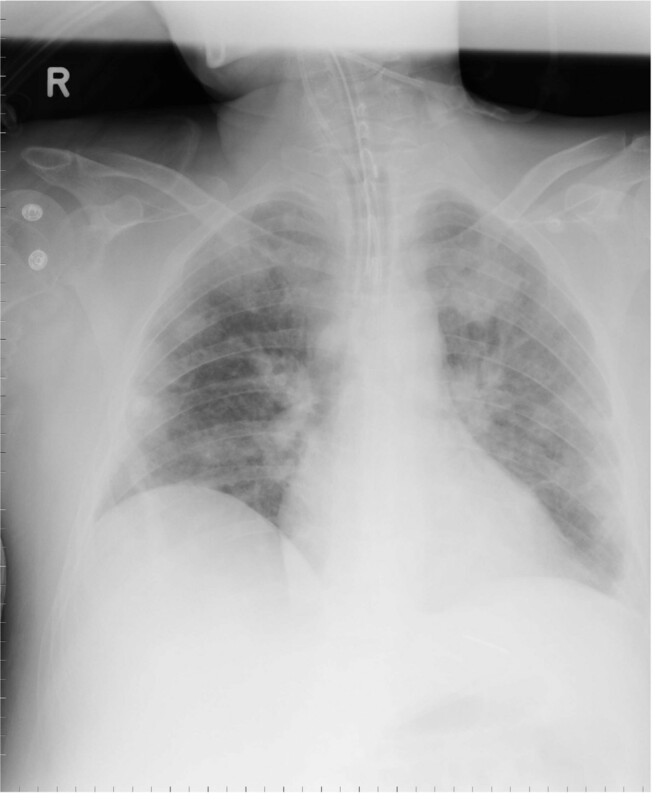 The patient was admitted to a local hospital where empiric antibiotic therapy with azithromycin and ciprofloxacin for radiologically confirmed pneumonia was initiated. Before onset of the acute illness, symptoms suggesting previous (e.g. viral) respiratory tract infection were not observed. After 3 days, the patient was referred to our clinic via an ambulance air service. Upon initial examination, the patient presented with severe sepsis including renal failure. 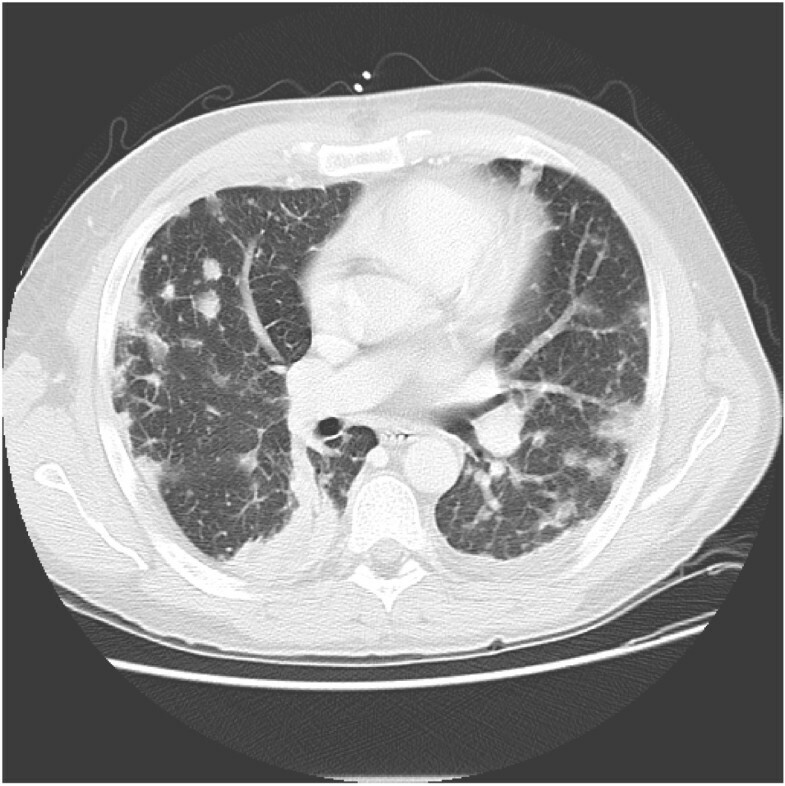 Staphylococcal necrotizing pneumonia was diagnosed based on culture results (blood and broncho-alveolar lavage specimens), clinical criteria, and a high-resolution CT-scan demonstrating signs of severe pulmonary infiltration (Fig. 1, and Chest-X-ray: Fig. 2). Extensive lung tissue necrosis was observed. The antibiotic regimen was changed to a combination of linezolid, imipenem and clindamycin. In correlation to the clinical presentation including high-grade fever [39.2 degrees celsius], laboratory assessment showed signs of severe inflammatory reaction (C-reactive protein 221 [mg/L], procalcitonin 12.4 [μg/L], white blood cell count 15.3 [×109/L], platelet count 182 [×109/L]. Over the ensuing days of treatment, physical examination and radiological imaging revealed abscess formation surrounding the right sternoclavicular joint. Later, progressive diffuse furunculosis next to the left clavicle (Fig. 3) occurred. High-resolution (HR-)CT-scan at admission showing signs of severe pulmonary infiltration. Chest X-ray imaging at admission. Clinical presentation of progressive furunculosis next to the left sternoclavicular joint. Blood cultures and bronchoalveolar samples obtained under triple antibiotic therapy were repeatedly tested positive for methicillin-sensitive Staphylococcus aureus (MSSA). Because of the unusual severity of the staphylococcal infection, community-acquired Panton Valentine Leukocidin (PVL)-positive MSSA septic shock was suspected . This was confirmed by PCR demonstration of the respective PVL-genes, as previously reported by us . Furthermore, the isolates were subjected to surface protein A (spa) sequence typing . All isolates investigated exhibited spa-type 284 which corresponds to multilocus sequence type ST121. This clonal lineage has been associated with furunculosis in the past decade in Europe and is associated to recent outbreaks . Within 6 days of triple antibiotic therapy with linezolid, imipenem and clindamycin, the patient developed progressive respiratory and haemodynamic failure including development of the Acute Respiratory Distress Syndrome (ARDS) requiring mechanical ventilation (FiO2 0.8, paO2 79 mmHg, PEEP 15 cmH2O, peak inspiratory pressure 33 cmH2O). Furthermore, vasopressor support was necessary for a subsequent period of more than two weeks. Ongoing abscess formation in multiple skeletal muscles (Mm. supraspinatus, triceps, quadriceps, gluteus maximus) required repeated surgical interventions and drainage despite organism-sensitive antibiotic therapy from the first treatment day (minimal inhibitory concentrations (mg/L): oxacillin and clindamycin both ≤ 0.25, linezolid ≤ 0.5). Several transesophageal echocardiograms never showed signs of infectious endocarditis. Assessment of an underlying immune disorder showed normal fasting serum blood glucose levels (before onset of severe sepsis), normal quantitative complement levels (C3, C4), and normal immunoglobulin (Ig) levels, including Ig-subclasses. Furthermore, flow assorted cell sorting (FACS) analyses were performed. These analyses revealed the presence of panlymphopenia during sepsis with a normal CD4/CD8 ratio. B- and T-cell numbers were found to be within the limits of normal after reconvalescence. After two weeks of ongoing metastatic soft tissue infiltration under triple antibiotic therapy (linezolid, imipenem, clindamycin), the anti-microbial therapy was changed to a combination of daptomycin and clindamycin. Continued antimicrobial and surgical therapy finally led to a stabilisation of the patients' condition. The patient was discharged from hospital on day 40. Oral antibiotic treatment with moxifloxacin was prescribed for an additional 45 days. Twelve months after discharge, the patient was found to be symptom-free and to be able to perform routine activities of daily life. PVL testing of the patient's household members revealed no PVL colonization of the patient's family. The case presented here shows features different from "common" PVL-positive S. aureus infection. First, previous case series have reported a high incidence of preceding viral respiratory tract illness [3, 6]. In our patient, respective symptoms were not present. Furthermore, we are unaware of any previous report indicating that progression of the disease to septic multiple organ failure including ARDS, acute renal and haemodynamic failure occurred under triple organism-sensitive antibiotic therapy with linezolid, imipenem and clindamycin. Interestingly, although this may certainly have been a coincidence, the clinical break-through seemed to be related to a change in the anti-microbial regime. The change to daptomycin and clindamycin was instituted as at this point in time therapy-refractory progressive metastatic soft tissue infection occurred despite organism-sensitive triple antibiotic therapy. Although daptomycin may be considered in cases of severe metastatic soft tissue infections, it seems important to mention that it should not primarily be used for the treatment of pneumonia. This is due to the fact that daptomycin is inactived by pulmonary surfactant . The use of a protein synthesis inhibitor, such as linezolid or clindamycin, may especially be beneficial in the setting of a toxin-mediated staphylococcal infection, and clinical data at least partially support such an approach . The clinical course of our patient may give further evidence that a clinical presentation that is consistent with a "PVL-syndrome" might be most appropriate to characterise this life-threatening condition . It should be emphasized, however, that the clinical efficacy of the antimicrobial therapy may be insufficient despite favourable in vitro sensitivity testing of the PVL-positive S. aureus. This may result in major problems with the management of the disease. Contrary to recently proposed therapeutic principles that aim at shortening the duration of antibiotic therapy whenever possible, this condition should be treated aggressively and over a long period of time in order to avoid relapsing infection. The "PVL-syndrome" might create a growing threat in the years to come – physicians treating staphylococcal infection should be watchful and alert. In cases of therapy-refractory PVL-positive staphylococcal soft tissue infection, a change in the combination of the anti-microbial therapy may be considered despite favourable in vitro sensitivity testing of the S. aureus. Daptomycin might be considered in such therapy-refractory cases. The authors declare that they have obtained written informed consent from the patient for publication of this case report. First of all, the authors wish to thank the patient for kindly providing informed consent to the publication of the data. The authors thank all nurses for their dedicated care. Furthermore, the authors thank N. Weich for language editing and proof-reading of the manuscript. JCS, FE, and DH collected all data and drafted the manuscript. DH and WW performed the PCR demonstration of the respective PVL-genes and subjected the respective isolates to spa-sequence typing. CS, AK, and AJ coordinated the input of all authors and helped to draft the manuscript. All authors read and approved the final version of the manuscript.